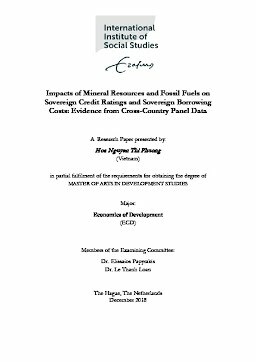 This research aims to investigate the impacts of mineral resources and fossil fuels on sover-eign credit ratings and sovereign borrowing costs. Each type of resource is separately inves-tigated for comparison purposes. The government bond yield is the proxy for sovereign costs and 10 year bonds presents long-term debts while 1-year bonds are proxies for short-term debt. The panel data set consists of 110 countries from multiple sources over the period from 1998 to 2015. To achieve the objectives, the study applies panel data regression analysis such as Fixed Effects as the main methodology, Random Effects and Random-Effects or-dered probit estimation as robustness checks. The empirical results imply that not every min-eral resource and fossil fuel variables has a significant impact on sovereign ratings or govern-ment borrowing costs. Mineral rents per GDP is the only variable having positive impacts on credit ratings while gas rents, oil rents and total extractive activity have negative influ-ences. In a sub-sample of high-income countries, none of the mineral resource or fossil fuels are significantly correlated to the ratings. The empirical regression on long-term government bond yields suggests that only oil rents and total extractive activity per GDP influenced 10-year bond yields negatively and significantly. While mineral rents per GDP and total extrac-tive activity per GDP positively affect on 1-year bond yields for high-income countries. The findings imply that rich-mineral resource and high-income countries have to pay higher in-terest rates for their short-term loans. Countries with higher oil rents per GDP tend to pay lower bond yields in the long-term.